Every pet deserves a comfortable and functional bite. Schedule an oral examination for your pet to check for possible misalignment or other common oral conditions affecting his/her bite. 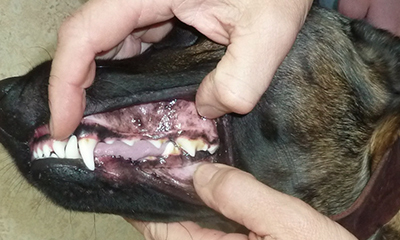 Overbite, underbite, mal-aligned teeth, impacted teeth, and extra teeth can contribute to a “painful bite”, possibly affecting their ability to retrieve and even eat. Oral exam of occlusion (normal). 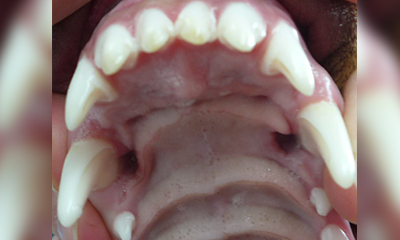 Example of a malocclusion (ie. overbite). 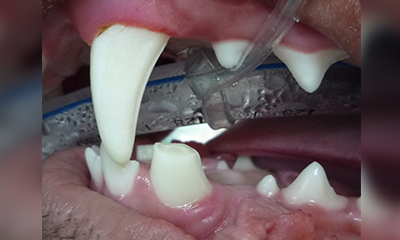 Palate contact from lower canines is painful. Crown reduction to relieve pain. We prefer and are routinely referred patients at a young age for mal-aligned teeth (ie. malocclusions) and can offer one or more solutions. These solutions or treatment are based on the breed of the pet, disposition, intended use/lifestyle as well as keeping it “simple” so we have the consistent/successful outcomes. 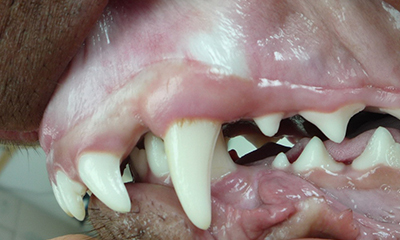 The majority of malocclusions are genetic, so we will counsel pet-owners on neutering or breeding concerns.